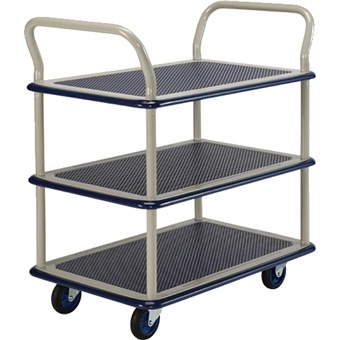 PRESTAR 3TIER TROLLEY 740x480mm 150KG NB105 2HANDLE is rated 4.6 out of 5 by 14. Rated 4 out of 5 by FST Singapore from Prestar trolley I just bought this for our warehouse usage, it is good and not noisy. Our previous trolley was very noisy. 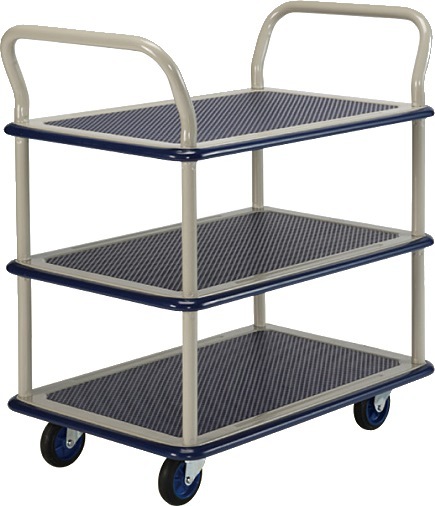 Rated 4 out of 5 by Apalite from PreStar 3-tier trolley Vendor called in to arrange earlier delivery, which is good! Item delivered as described! Rated 5 out of 5 by Elijah from Good Reputable Trolley I only buy Prestar trolleys. I highly recommend to anyone. Rated 5 out of 5 by Travis from Product as advertised Decided to purchase the trolley since they provided free delivery. Item was delivered on time. Rated 5 out of 5 by Lynne from Very Smooth We use this trolley for a Tea Service in our School. We find the wire surrounds very safe. The trolley is very smooth running, easy to turn and move, quiet.